The findings of the latest UN Climate Report lay bare the impacts of climate change. Internews’ Earth Journalism Network (EJN) works with journalists in places highly vulnerable to climate change and environmental degradation to ensure that they have the expertise and resources to report and raise awareness about the environmental issues facing their communities. 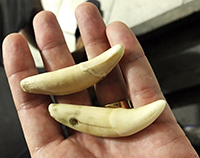 Fang traffickers offer between $100-150 for each jaguar fang. This price rises as high as $5,000 in China. Credit: Eduardo Franco Berton. Through EJN’s Biodiversity Media Initiative, reporters from 44 countries have produced more than 350 news reports and stories highlighting biodiversity threats, including habitat loss, illegal wildlife trade and climate change. For example, our local journalist partner, Eduardo Franco Berton, investigated and exposed illicit trade in jaguar parts, showing how sellers and smugglers in Bolivia, Peru and Brazil escape laws, controls and inspections. The resulting multimedia report was produced in English and Spanish, reaching thousands of readers through multiple news outlets. Davit Farulava, a journalist trained at an EJN supported workshop in the Republic of Georgia, wrote a story about how poor waste management at an oil company's site was linked to the deaths of hundreds of birds, including endangered species. The article raised a great deal of attention, forcing the company to close its site a few days later. Please join us today as we support journalists who seek the truth, including those at the front lines of climate change.